If you’re looking to make your next event an impressive affair, The Boardroom at Stone’s Steakhouse is the place for you. This exquisite dining space seats up to forty people and is an intimate yet spacious room set aside for guests’ special occasions. Private birthday parties, small wedding receptions, corporate meetings, pharmaceutical sales presentations, and other affairs can all be held in The Boardroom at Stone’s. What to expect when YOU book The Boardroom? 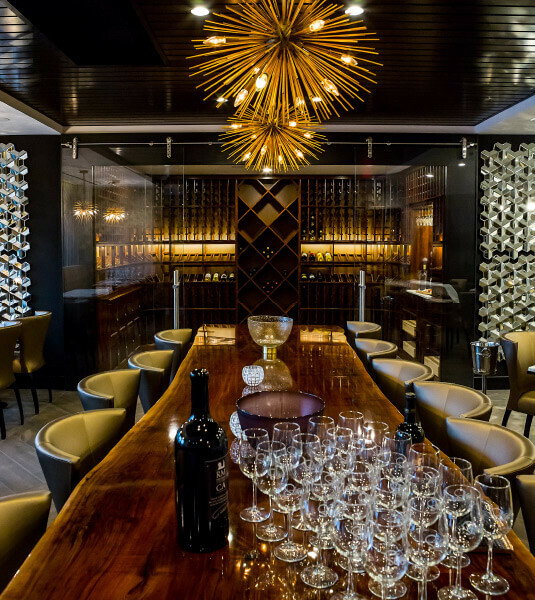 Not only do we host large-scale gatherings, but we also offer a more intimate experience in our Private Wine Room. Engagements, anniversaries, romantic evenings, or any other special occasions are perfect for this space at Stone’s. Our Private Wine Room will give you an evening filled with special memories that you won’t soon forget. Stone’s is the only Steakhouse in Syracuse that provides inclusive service like this, and we want to share it with you! Our impressive wine wall, 15-foot hand-hewn, polished, black walnut table, and gas fireplace are all available in The Boardroom to enhance your experience and impress guests at your event. This space is offset from our dining room, so your celebration, corporate meeting, or any other affair will be private and exclusive to your party. The sophisticated interior design with a flare of art-deco will impress guests and elevate your event. Reservations for The Boardroom can be made up to three months in advance, so book yours today! This impressive banquet room is the perfect space for hosting your next special event, and the staff at Stone’s will provide you with exceptional service. Trust Stone’s for your next party, celebration, corporate meeting, or other events! Contact us to check availability and book The Boardroom today!